1. Flat Pricing – The market should continue to be soft (flat to negative) without consideration to loss activity. 2. 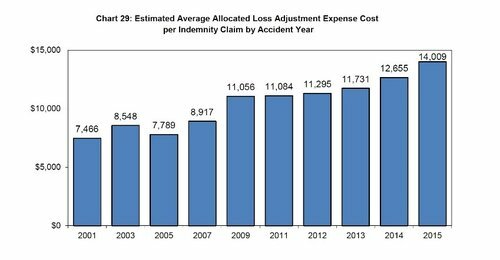 Cost to Adjust Claims – Claim management costs continue to increase and will eventually adversely impact rates (2nd half 2018 or beyond). 3. Cumulative Trauma – Post-termination and/or cumulative trauma claims continue to be a major issue with few (good) defenses for insurers. Rates are lower than they were in 1978! That is amazing! What other product costs less than it did 40 years ago? This is due to the safety movement reducing frequency and severity of claims. Anytime an employee misses time from work the average medical cost on the claim is $42k. That is a considerable amount! This is why insurers prefer to resolve potential fraudulent claims at a lower value. There is no winning here. Permanent disability awards are rampant in California compared to other states. CA is more than double the median across the country and is the highest in the country. This drives up settlement costs to resolve claims. With reference to point (4.) above, the cost to resolve (and/or defend) claims in California 2-3 times more than most states. In a decade and a half the cost to resolve a claim has doubled. Independent Medical Reviews (QME & AME) add a significant amount of time to the life of a claim. The actual number of IMRs in 2014-2015 was nearly 5x the amount the WCIRB estimated would occur. This IMR process also adds a considerable amount to the cost of the claim (ALAE). As this trend continues to develop it will have adverse effects on claim costs and rates. This is scary. We illustrate this because insurers may anticipate loss experience on policies that have already closed with no losses. Old claims may re-open under "new and further" tort and cumulative trauma claims may appear where no loss existed at all previously. Only a fraction of medical is paid at the 3-year mark for indemnity claims. This tells us that “liens” are a big factor in the medical cost by unapproved providers (typically on litigated and cumulative trauma claims). This is consistent with a high frequency of fraudulent or litigated claims whereby an attorney is directing care out of network. This is the biggest problem with the entire comp system.. Employers used to be able to rely on a couple of labor codes (3600 and 3208) to assert post termination reporting as a defense. The interpretation of these laws has been significantly watered down and unfortunately is no longer a reliable defense. Applicant attorneys understand this so post termination and most litigated claims assert some form of cumulative trauma that are difficult to defend and runs up medical lien costs. These claims will continue to be a problem that continue to add to the overall cost of the work comp system.